Guests must be SDHS members or pay $10 at the door. Registration not accepted until 30 days before the event. 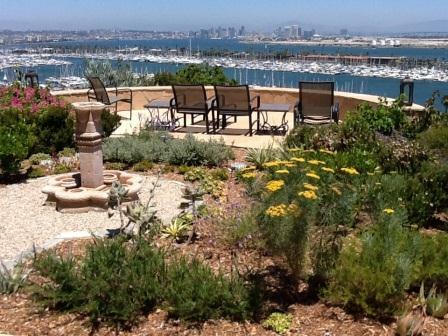 This La Playa garden has a spectacular view of San Diego Bay and the city. However, it also has an amazing garden created by the owners. The emphasis is on plant variety, but the owners attention to detail and creating vignettes can be seen throughout...provided you can stop staring at the view. The garden was started from scratch in August of 2008, except for a Meyer lemon and pineapple guava which were allowed to remain. The former house was demolished since the house had been occupied for 10 years by a series of Navy Seals and was in very poor shape. There was no landscape plan, but the garden evolved as plants became available in area nurseries which Carey prowls regularly. This is a collector's garden, and no landscape designer was involved. The plant pallet is mostly drought tolerant Mediterranean species and cultivars, and the current planting list exceeds 480 varieties (though some have been removed from the garden). 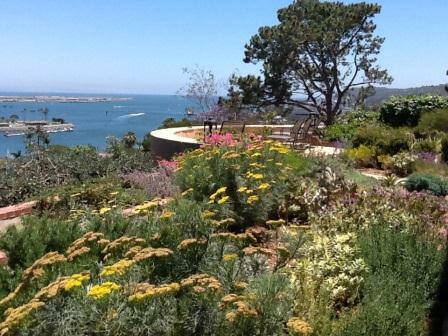 Being in the La Playa area of Point Loma, the climate is Sunset zone 24, with a cool, often foggy and breezy marine influence of San Diego Bay. All watering is manual, with 19 stations connected to ball valves with soaker hose, mostly underneath weed fabric, covering almost all of the 78' x 160' lot. They are all turned on at once, usually left on for an hour, repeating as necessary throughout the year. Carey is (mostly) an organic gardener and chips and composts all the trimmings on the property. Plants of particular interest include an Acacia dealbata near the telephone pole, from a seed planted in a pot about 7 years ago. It's now approximately 70' tall, an extraordinarily fast grower. Next to it is a beautiful Kashmir Cypress (Cupressus cashmeriana = darjeelingensis). There are 11 varieties of Pittosporum tenuifolium, all beautiful and considerably different, in the entry garden and courtyard. There are many agaves, aloes, and succulents. The house will not be open for viewing, but be sure to go up the spiral staircase to the deck from below the house, for the view and garden perspective. Their love gardening of shows everywhere and we are very fortunate to have Carey and Steve share it with us. Directions are emailed in the registration confirmation message.